SPAIN CAME INTO the 2002 World Cup as one of the favourites. They had one of the deadliest strike partnerships in the world—Real Madrid forwards Raul and Fernando Morientes. However, in the first two matches, Deportivo La Coruna’s Diego Tristan was preferred to start alongside Raul. Morientes came on for Tristan in both matches and immediately showed the almost telepathic understanding he had with his club colleague. In the second match, he scored two goals to help Spain overturn a one-goal deficit to win 3-1. Spain coach Jose Antonio Camacho was left with no choice but to start the two together in the third match. Raul played off Morientes to score two goals and Spain went on to top the group, scoring nine goals (five for the deadly duo). In the Round of 16, Spain faced a strong Republic of Ireland team featuring the likes of Robbie Keane and Damien Duff. 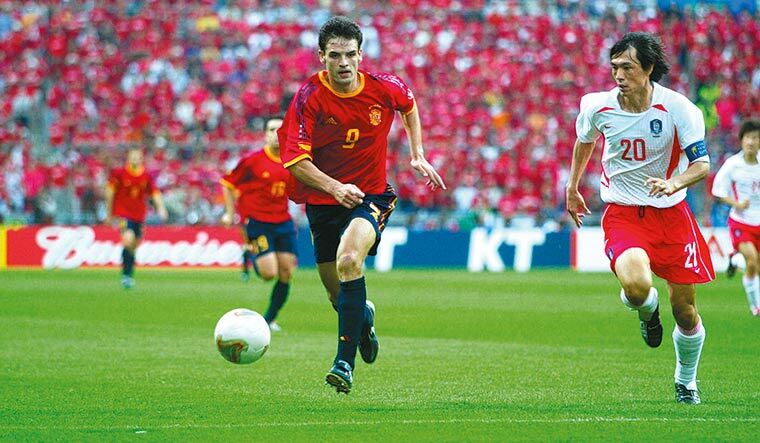 Morientes put the La Roja ahead with his third goal of the tournament, but Keane equalised with a 90th minute-penalty. Spain went through after a shoot-out to face the dark horses of the tournament, cohosts South Korea, in the quarterfinals. It was one of the most memorable matches of that World Cup. But, as so often was the case, Spain were on the wrong side of an upset. The Koreans held them to a 0-0 draw before winning on penalties. Morientes was so nearly the hero as he put the ball into the net in the first half of extra-time, only for the golden goal to be wrongly disallowed. The linesman felt the ball had gone out of play before it was crossed to Morientes. But replays showed it had not. Minutes later, he hit the post with a first-time half-volley. But it was not to be. And it was the last ever World Cup match for Morientes—one of the best strikers of his generation. Born in Caceres, Extremadura, in 1976, Morientes made his top flight debut in 1993, aged 17. He played for clubs in Spain, France and England. He was the top scorer in the 2003/04 European Champions League, helping his side Monaco to the final, which they lost to Jose Mourinho’s Porto. He retired from football in 2010 with more than 200 career goals. Morientes made 47 appearances for Spain and scored 27 goals, including five at two World Cups. Though he made a brief return to playing in the Spanish fourth division in 2015, in September that year, he got involved with the LaLiga World Challenge programme. Created in 2014, the initiative aims to raise the image of Spanish football internationally. 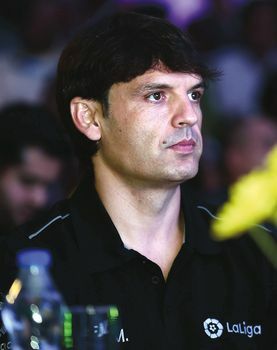 Morientes recently came to India, in his capacity as LaLiga ambassador, to launch LaLiga World in the country. As a part of the initiative, Kochi will host India’s first pre-season football tournament with top flight international clubs. Kerala Blasters will face Australia’s Melbourne City and Spain’s Girona in the tournament scheduled to start on July 24. What are your thoughts about the Russia World Cup. How does it compare to previous editions? The big difference is that all the big teams are struggling. All the favourites are struggling and that is, maybe, what is different to other World Cups. But a World Cup is always really difficult. What did you think of Spain’s performance so far? I expect Spain to improve. Keep improving. It is true that the group stage has been very difficult. But, what is relevant is that we have qualified for the Round of 16 and as group leaders. Spain needs to reach at least the semifinal. At the beginning, it is always the same. Spain starts slowly. They need to improve the defence. Normally when Spain play against big teams, they improve the level. At the beginning, all the people were thinking that group [B] is very easy for Spain. It has not been easy. Morocco played very well. Iran played very, very well. Cristiano Ronaldo scored a hat-trick against Spain. He is the record goal scorer for your former club Real Madrid. What do you think about his growth as a player over the years? You cannot say anything new to describe Cristiano. He is one amazing scorer. He has been proving for years that he is the best player in the world. I hope that he keeps playing for Real Madrid at this level for many years. As a former striker, which forward do you think will have the biggest impact on this World Cup? There are many—Cristiano [four goals], Romelu Lukaku [four goals], Harry Kane [five goals]. Who has the most impact will depend on the number of matches the players play, and on how far the national teams go. Of course, it will be a No 9 [the centre-forward; like Ronaldo, Gabriel Batistuta, Alan Shearer]. Apart from those I mentioned, there are others who could come from behind and have a big impact. Don’t forget Diego Costa for Spain. Do you think Spain are favourites? I cannot say that Spain is the favourite. But they are definitely one of the top contenders. Who are the other top contenders? I like how Belgium have played. They have played magnificent football and they have a great squad. They have chances. Brazil is always a favourite for everybody. England needs to change their image [as underperformers] at the World Cup. So, I think they will be there. What do you think is Belgium’s weakness? They need to watch out for defensive mistakes. Belgium has very good forwards. Their attack is superb. But, usually defensive mistakes are what gets you out of the World Cup. Do you think Croatia has a chance of winning this World Cup? They are the dark horses who have come closest, when they finished third in 1998. Definitely. They have a chance. They have started really well. They are playing really good football and they have really good players. They have two of the best midfielders in the world. Both playing in LaLiga. One for Real Madrid, Luka Modric, and the other for Barcelona, Ivan Rakitic. Some teams in this World Cup have been playing with two strikers. In recent years, the lone striker has been a trend. You were part of a legendary strike partnership with Raul for both club and country. Which is your preferred system? I like the fact that the role of the centre-forward has been brought back. For many years, formations like ‘false 9’ [a lone striker who drops deep into midfield; Lionel Messi at Barcelona] were tried. But, there is fear of the No 9 again now. The names coming out of this World Cup like Lukaku, Kane and Costa are great examples. I always loved to play with another forward. Always [a person with] different characteristics than mine. So, we could complement each other.